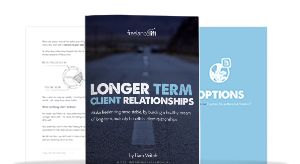 It’s too easy to accept unpredictability and ‘project-to-project’ work so in this book I want to address the fundamental knowledge required to consistently build longer-term, mutually beneficial client relationships. Moreover, we’re resigning ourselves to the ‘up then down’ freelancing roller coaster. In my book ‘Stop Thinking Like a Freelancer’ I touched on this topic and between this book and the next one I want to dive deep on addressing it. We’re looking at freelancer stability and how it’s achieved. By the end of this book (and the course that runs alongside it) you’ll have the required perspective and clarity to make better decisions for the stability of your business.